Peach, Strawberry, Pineapple and Orange flavoured yogurt drink with added plant stanols, sugars and sweetener. 1 a day. Proven to lower cholesterol. With plant stanols. With heart health vitamin B1. Low in sat fat. No colours or preservatives. No artificial flavours. Suitable for vegetarians. 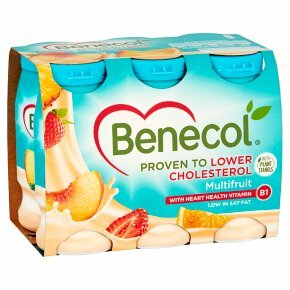 Not only is this delicious yogurt drink bursting with taste, having just one bottle a day also lowers your cholesterol by 7-10% in just 2 to 3 weeks thanks to our unique plant stanols. Each bottle also contains an extra boost of heart-healthy vitamin B1* which is shown to help heart function. *Vitamin B1 contributes to the normal function of the heart. Plant stanol ester has been shown to lower cholesterol. High cholesterol is a risk factor in the development of coronary heart disease. A daily intake of 1.5-2.4g plant stanols lowers cholesterol by 7-10% in 2-3 weeks. Each bottle contains 2g so that's why one bottle a day gives the effect when consumed with a main meal and as part of a healthy diet and lifestyle, including your '5 a day'. The beneficial effect is obtained with a daily intake of 1.5-3g plant stanols.